How Much Melted Shortening Do I Use in Place of Oil in Cake Mix? Store coconut oil in a cool, dry place for up to two years. 1 How Much Melted Shortening Do I Use in Place of Oil in Cake Mix? Use coconut oil measure for measure as a substitute for other fats in your recipes. Whip it into smooth, tasty icing, cut it into your dough for flaky pastries or melt it to use in pancake or quick bread recipes. The amount of coconut flavor that the oil gives the finished product generally depends on the type of coconut oil that you use. Look for quality coconut oil that's minimally processed for maximum benefits. Many bakers and home cooks turn to coconut oil as a natural, vegan alternative to traditional fats that can be used for both baking and cooking. Not only does it add a slight sweetness and a lighter texture to baked goods, coconut oil's possible health benefits have enticed many bakers to use it in place of shortening, margarine, butter and conventional cooking oils. In the past, the hefty levels of saturated fat vilified coconut oil among nutritionists and health-conscious consumers. 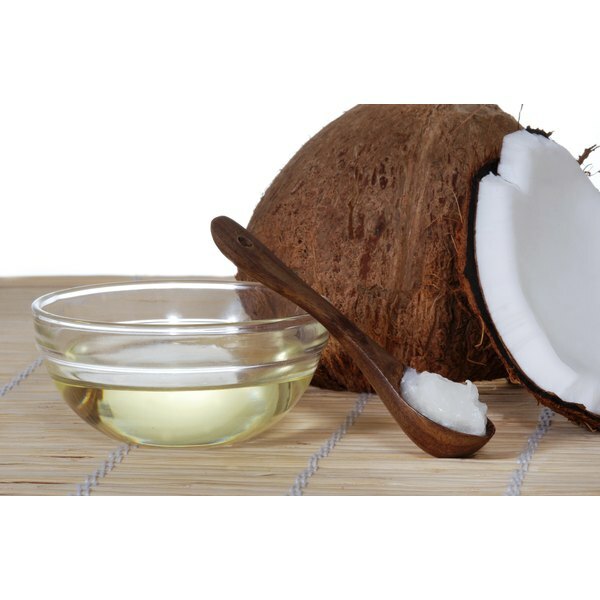 By 2011, popular opinion began shifting and coconut oil gained traction as a healthy fat. Although the oil is about 90 percent saturated fat, most of that fat comes from lauric acid, which is a medium-chain saturated fatty acid that has antimicrobial properties. Coconut oil can be found at grocery stores, health food stores and online. No matter where you choose to buy it, coconut oil comes in two main categories: refined and unrefined. Refined coconut oil is nearly tasteless, making it an ideal choice when you don't want to add coconut flavor to your baked goods. Many refined coconut oils rely on chemical processes, and they may be partially hydrogenated, a process that creates trans fats. Look for non-hydrogenated oils that are refined using a natural process. Both virgin and extra-virgin coconut oils fall under the category of unrefined oils. Choose unrefined coconut oil for maximum flavor. The amount of coconut taste typically varies among brands according to how the oil is extracted from the coconut. Both types of oil have a shelf life of approximately two years. Use melted coconut oil to replace any oil in your recipes, using a 1-to-1 ratio. Coconut oil melts at 76 degrees Fahrenheit. To melt coconut oil, place the jar in a bowl of hot water and keep it there for 5 to 10 minutes. Alternatively, heat it in a saucepan set over low heat or in a microwave-safe bowl placed in the microwave for 10 to 30 seconds, or until the oil melts. Quickly mix melted coconut oil into cold ingredients to avoid ending up with lumps. Coconut oil does solidify quickly when it's exposed to cold temperatures, but remains liquid when you mix it with room-temperature ingredients. Because coconut oil remains solid at room temperature, it makes an ideal substitute for butter, margarine or shortening in recipes such as pie crusts or biscuits, which rely on solid fats for their flaky texture. It’s equally well suited to using in cookies, muffins and cakes, which typically are made with solid fats such as butter or margarine that is creamed with sugar. When exchanging coconut oil for another solid fat, use an equal measure. To keep the oil in its solid state, chill the coconut oil for a short time before using it, although if you keep it in the refrigerator too long, it will harden and become difficult with which to work. Coconut oil has slightly less moisture than butter, so add an extra measure of whatever liquid your recipe calls for to maintain the proper consistency, if necessary. 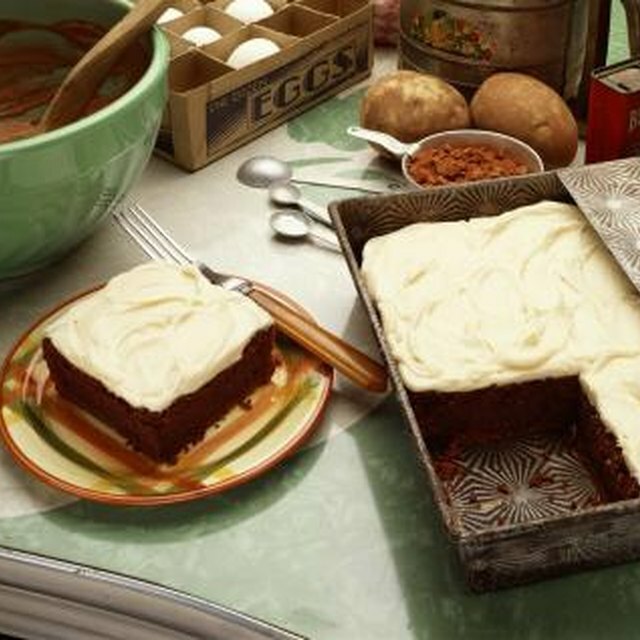 Can I Use Pudding Instead of Oil in Cake? Does Canola Oil Taste the Same as Vegetable Oil When Baking?